Although the young children who will want to see Annie on stage will have the 2014 movie in mind, Annie itself was actually originally a Broadway musical, first performed in 1977. And the recent film adaptation is actually the third movie to focus on Annie's story: the original movie (often considered to be the best of the trilogy, if you can call it that) was released in 1982, followed by a 1999 flick produced for television by Disney, and finally the aforementioned remake from 2014. Regardless of where you first heard about Annie, though, the main story remains very similar to that of its predecessors. It's New York City just before Christmas 1932 and Annie (Anya Evans), one of eight orphans living in Miss Hannigan's Municipal Girls Orphanage, dreams about one day leaving to find her true parents, especially since Hannigan (Lesley Joseph) treats the children terribly by forcing them to constantly work, particularly through sewing. Annie makes a failed escape attempt and Hannigan thinks that Annie is once again under her control, until a lady named Grace Farrell (Holly Dale Spencer) pops around. It turns around that the famous billionaire Mr. Warbucks (Alex Bourne) is looking to bring an orphan to live in his mansion over the winter holidays, and given the description that Grace provides, Annie is the perfect choice, much to Hannigan's chagrin. Annie loves the opportunity to enjoy life under Warbucks' watch, and Warbucks himself wishes to adopt Annie permanently. However, Annie's real hope is to meet her real parents, and so Warbucks begins a search to find Annie's true parents using his contacts, the local radio and even President Roosevelt (played by Callum McArdle), but to no avail. The stakes are raised when Warbucks offers $50,000 if Annie's parents resurface, which offers the unscrupulous Hannigan and her two equally incorrigible friends Rooster (Jonny Fines) and Lily (Djalenga Scott) an opportunity to try and deceive their way to the five-figure prize. It all leads to an eventful 24 hours over the Christmas period where twists and turns lead to the truth being revealed, and with the audience discovering where Annie's future will lie (bear in mind that Annie was only sent to live with Warbucks for the two weeks over Xmas; she was required to return to the orphanage after that). The story is simple and easy to follow, and it's clear from early on who the audience should be backing and who it should dislike. Anya Evans is great as Annie; the star of the show, she displays acting and singing talent (her rendition of "Tomorrow", which is repeated by other characters later on, is the most memorable song from the entire show), which could make her a well-known star in the future. The other children also shine during their own musical numbers (an example being It's The Hard Knock Life; not the Jay-Z version, by the way, as that one came later and is a bit too risqué for a family show), and Andie Jordan in particular is very good as Molly, the youngest of the orphans. The other characters do a good job on the whole; it's either a compliment or a downside that Lesley Joseph is unrecognisable as Hannigan due to her portrayal of the evil orphanage owner. 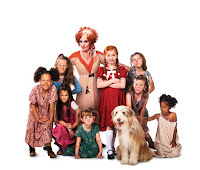 In summary, Annie is a fun night at the theatre for all the family, particularly the youngsters in attendance who will have seen the 2014 film and will enjoy seeing it come to life on the stage, as will older members of the audience who may have seen the original movie.